Nigerian Chief Kikelomo Laniyonu Edwards has been elected as a Full Member of the World Dementia Council at a meeting in London where the Council was re-formed to include representation from all over the world. An excited Kiki (as her friends fondly refer to her) promises to use her 3-year tenure to ensure Nigeria and other African countries continue to work towards reducing the stigma, contributing effort into finding a cure, and developing a dementia strategy to care for people with living with Dementia. The creation of a World Dementia Council was one of the main commitments made at the G8 Dementia Summit in December 2013.The new Council brings together the broadest range of influential global leaders with expertise and experience in dementia from all sectors, enabling in a bid to challenge and support Governments, industry, NGOs, public sector, academia, the research community and people with dementia worldwide in a concerted effort to address the world’s biggest disease burden. Care of people with dementia varies hugely across the world, and many experience stigma and social isolation – 40% say that they have been avoided or treated differently. Dementia is sometimes perceived as a normal sign of ageing, mental illness or even by certain cultures as having supernatural elements. People can also be victims of abuse, for example being beaten for being ‘stubborn’, restrained regularly, both physically and by use of antipsychotic drugs, and cast out from their communities. “I thank the World Dementia Council and Envoy for the remarkable progress they have made so far, setting us well on the way to achieve the aims we first established at the G8 Summit as part of the UK Presidency in 2013. While we are seeing progress in drug development and greater understanding of this disease, there can be no cause for complacency and I look to the World Dementia Council to use their expertise and global reach to drive governments, industry and regulators to further action”. View the World Dementia Council press release here. For Dementia Awareness Month Day 7, I have been attending a Research Forum, with no time for writing and blogging, or even finishing off one of my draft blogs, but this image and quote, from alzheimers.net says it all for me today. If you are a care partner for someone with dementia, and feeling jaded, over stretched, sad, or burdened, please try to remember what it is like on our side of the fence. 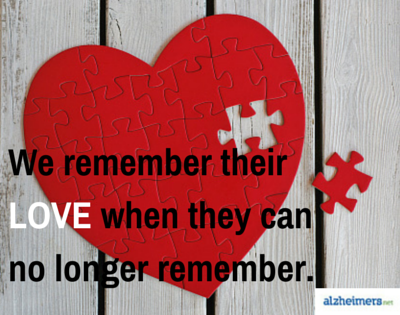 Your partner with dementia still loves you. Please, try to remember their love for you. We [they] do not mean to be a burden to you. We are living with a terminal illness, that is stealing our capacity and functioning. It is definitely not fun for us either, and having dementia is not our fault. Researchers at King’s College London (and internationally) have developed techniques promising to accurately measure a person’s “biological age”. People of the same chronological age vary in their rates of “biological ageing” – sometimes by margins of up to 15 years, plus or minus – so an individual measure of biological age could be a more accurate prognostic measure. The test under investigation involves examining the “ageing signature” in biomarkers of gene activity across 150 genes in the body’s cells. Such a test would potentially help predict when a person might die, and could help identify people at high-risk of dementia and other conditions; apparently largely independent of (or impervious to) various lifestyle interventions. Such a development would have serious implications for the future of medicine, pensions and insurance, particularly as it is not (yet) known to how to slow the biological ageing processes in question. The memory café was established as part of our awareness building campaign in support of all elderly people living with Dementia in Nigeria. What is a “Memory Café”? A Memory Café provides a place where any member of the public, who feel that they, or a person they know, may have a short-term memory problem, can drop in without an appointment, and talk to an experienced volunteer or a professional. Memory Cafés provide strong levels of stimulation for the service users and an opportunity for carers to exchange experiences and information. 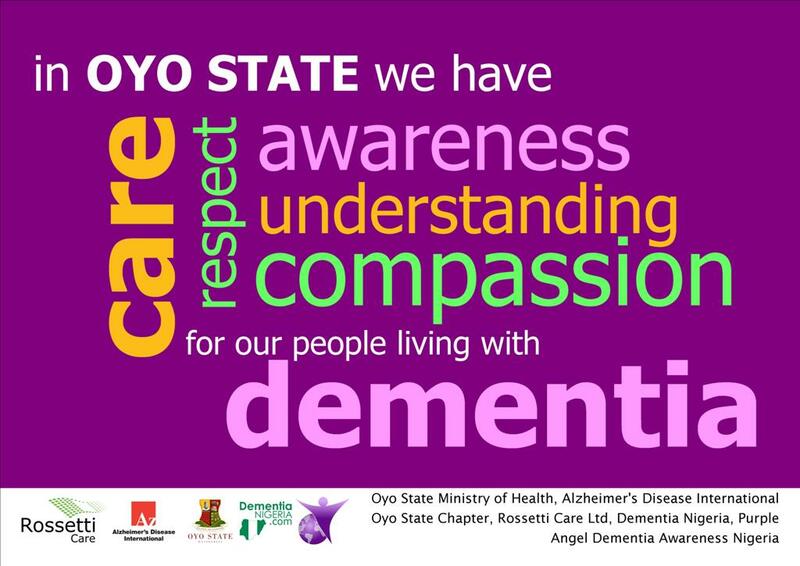 The event hosted by Dementia Nigeria was sponsored by Rossetti Care with support from Purple Angel Ambassadors. The main themes for the event was Health Care, Communication, and Community Involvement for people living with dementia in Nigeria. Of course other topics came up including wider social policy and aging strategies for Nigeria. Dr O M Lawal representing the Permanent Secretary of the Ministry of Health was given a thorough yet good-humoured grilling by participants when he gave his address. He also had the audience cheering as he delivered his keynote address. Professor Aduke Adebayo, Purple Angel Ambassador, spoke about her passion for what we do, and imploring the community to help get rid of the stigma that plagues People Living with Dementia and their loved ones in Nigeria. The Community Womens’ Leader attending talked about the need to spread awareness amongst all communities, as she herself had always thought that dementia was “spirits” at work, but she is beginning to understand more. Professor Ogunsheye, Purple Angel Ambassador, challenged Dr Lawal as to why Nigeria still does not have a policy on ageing. Dr Lawal answered that it is early days for the new Federal administration. He explained that Oyo State has policies in place, and has had for years. He cited examples of work being done by the Governor’s wife, Mrs Florence Ajimobi to ensure free health care across the State for the elderly. Local Doctors also took part as did Community Leaders and as ever we were supported by the enthusiastic Nigeria Youth Service Corps (NYSC). Other group discussions and informal consultations took place. Kikelomo Laniyonu Edwards and Professor Baiyewu made time to discuss the AD8 Dementia Screening test and other tools she obtained through the Dementia Knowledge Exchange Global. We also had a great time. A big thank you to everyone who helped and who pledged to continue supporting. We also have to extend a big thank you to Norman McNamara, the founder of the Purple Angel Movement. Norman McNamara a resident of Torbay, Devon, UK was diagnosed with dementia at only 50 years of age. Whilst out shopping one day he was rudely spoken to by a shopkeeper and decided to change the way people see dementia and treat others. The rest is history as Purple Angel Ambassadors spread the message of tolerance, acceptance, understanding and compassion for people living with dementia. Together we are making a difference. Worldwide. Nasal Instillation (Nasya) & its Neurological, Psychological and Anti-aging effects. September 2015 will mark the fourth global World Alzheimer’s Month™, an international campaign to raise awareness and challenge stigma. The theme for World Alzheimer’s Month 2015 is Remember Me. We’re encouraging people all around the world to learn to spot the signs of dementia, but also not to forget about loved ones who are living with dementia, or those who may have passed away. The impact of September’s campaign is growing, but the stigmatisation and misinformation that surrounds dementia remains a global problem. Every September Alzheimer associations across the world take part in an international campaign to raise awareness and challenge the stigma faced by older people living with dementia.